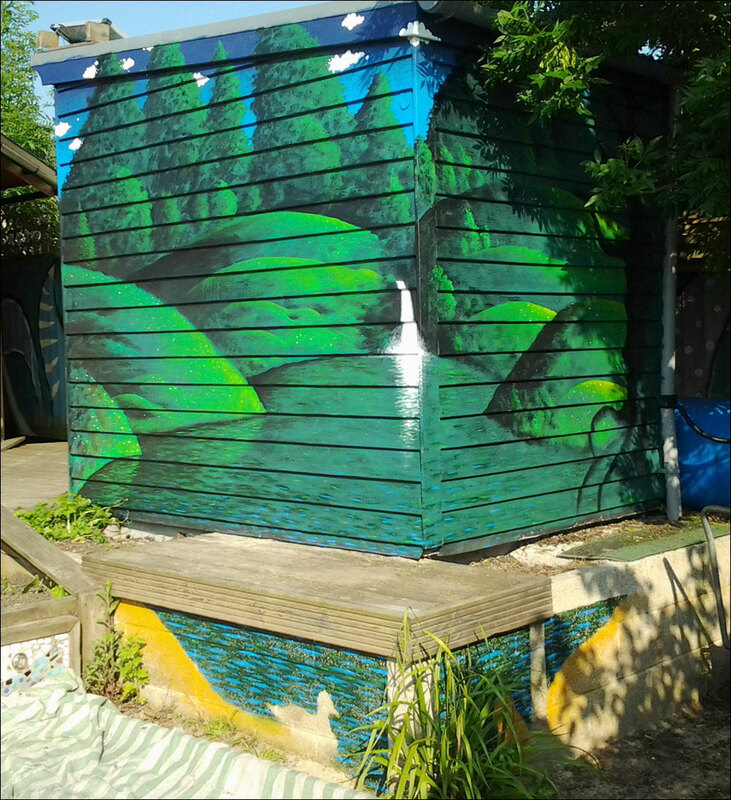 Mural, painted in June 2013, on the walls of the compost toilet at the Barracks Lane Community Garden, in East Oxford. I must go finish this soon! 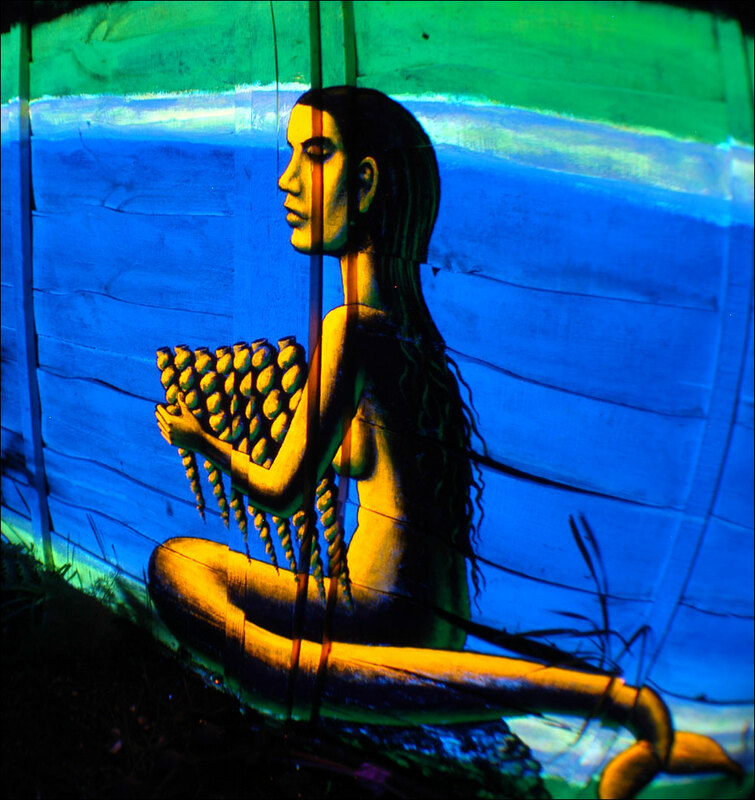 Below is a short stop-motion film of me painting this mural. I rubber-banded a smart old MP3 player with a camera app (Tina’s Time Lapse) onto the handle-bars of my bicycle. I set the app to take a photo every 2 minutes. These were stuck together in sequence and are shown for half a second in this simple film. This is my first real film – I hope you like it. 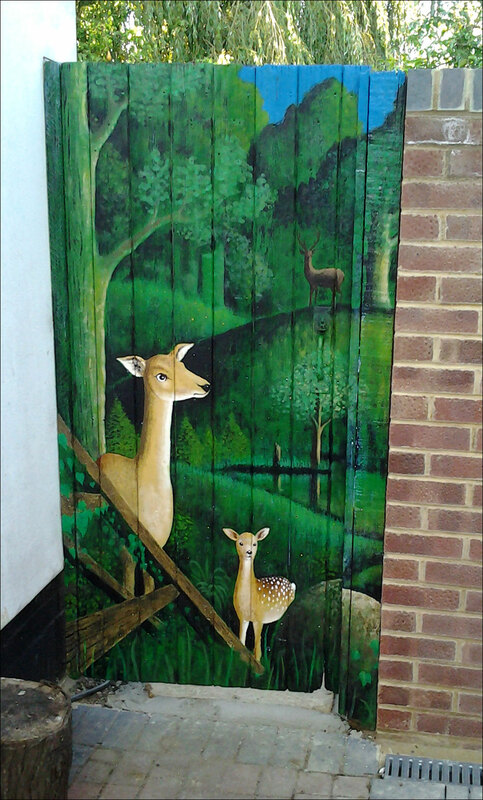 I really enjoy painting murals, and hope to do a few each summer. of folks might enjoy the art. I tend to use acrylic, which is expensive but quite weather-resistant. like a gate or fence. 5 or more years of sun. Walls that get less sun fade much less. on Lytton Road in East Oxford. It’s visible from the street which is nice. 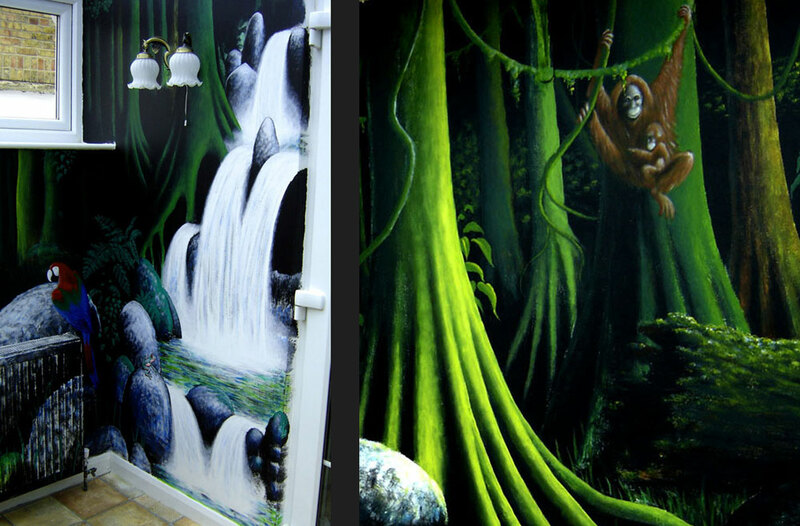 Here are three photos of a mural I painted in 2008 in a private conservatory in East Oxford – a jungle scene that was very fun to work on. This doodle was painted at Christmas in 2007. I call it “Dead-car-DJ”. I can see a DJ spinning two records, but those records are also the wheels of the upturned car. 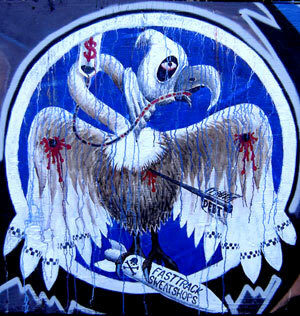 Some folks can also see a dinosaur head, the ghost of ‘fossil-fuels’, where the two wheels are the eyes. 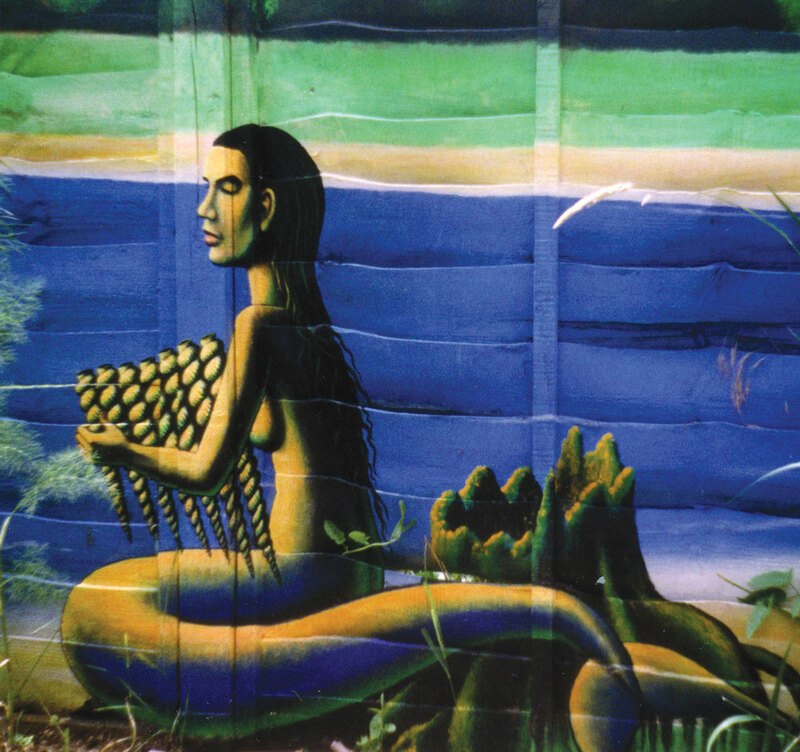 This mural is on the back wall of the ‘Clems’ night-club in East Oxford, accessed from the back street by Cafe Cous-Cous. Here is a sad little story. Learn from my mistake! much of the work in the evening, painting with poor light in the cold. ‘un-dried’ paint and it had run down the wall, then drying in the sun. the U.S.A. Ironically this white hood might remind you of the KKK. Yikes. skateboard ramps off Meadow Lane in East Oxford. The water-paper basket below the letter “G” has a scroll of paper in it, labelled “UN convention of Human Rights” – reference to the illegality of the US war on Iraq. The eagle is clutching a long bomb that is labelled “Fast-track Sweatshops”, a clever idea that I ‘borrowed’ from the cartoonist duo Carol & Simpson. After Iraq was bombed back into the dark ages in the ‘shock and awe’ campaign of 2003, it’s economy was gutted and turned into a vast experiment in neo-liberal “free-trade” with privatisation, union-bashing, sweat-shops and deregulation, as documented in many places including in Naomi Klein’s exellent book The Shock Doctrine. 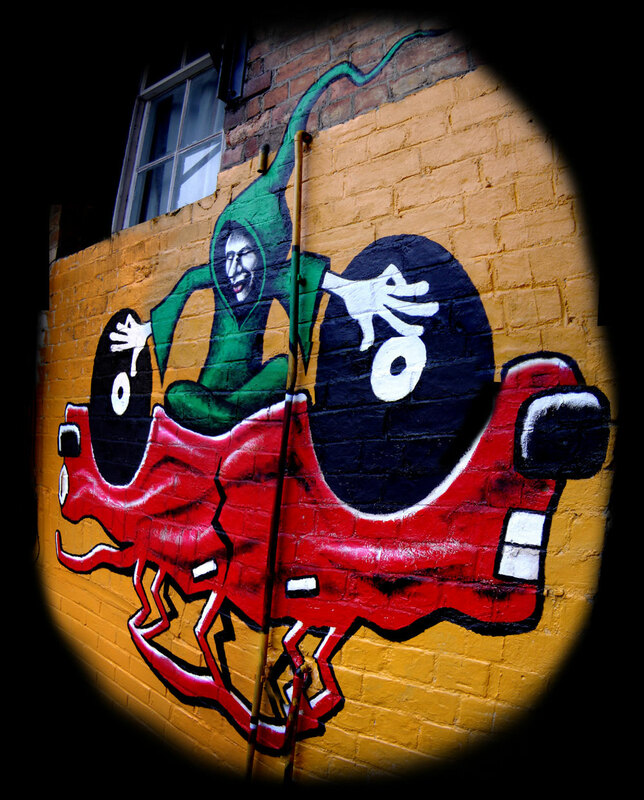 Here is another doodle, painted on the side of a shop off the Cowley Road in 2005. It was inspired by a simple little line drawing I found online years ago of a little girl smiling widely while sitting on a swing. The swing was suspended from the long gun-barrel of a large army tank. Sticking his head out the top of the tank was the head of a soldier, with a confused and slightly annoyed expression on his face. A great cartoon. 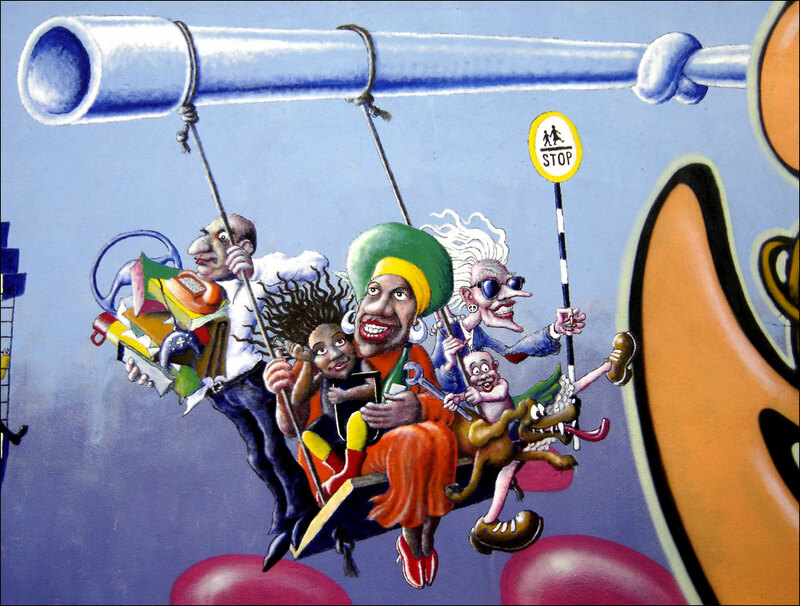 In my mural, I have also tied a knot in the gun-barrel! 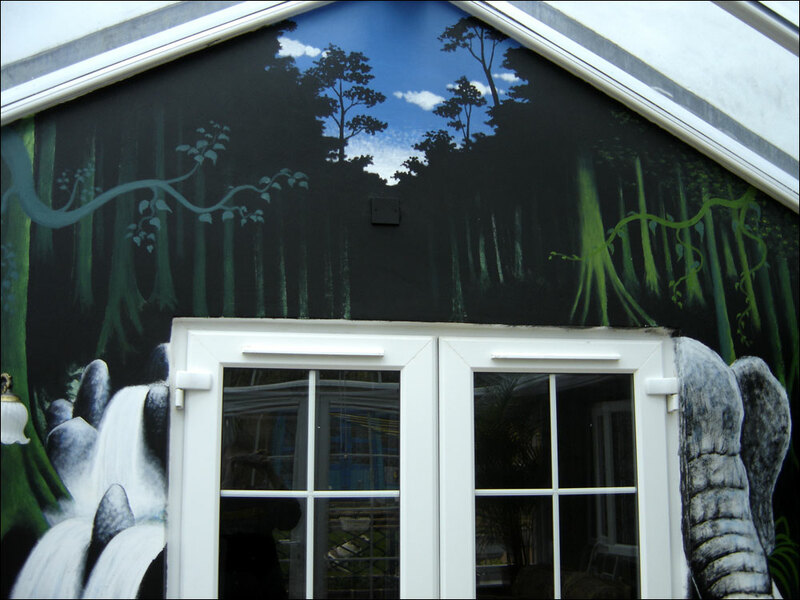 Here is a mural I get the most positive feedback from. Not too sure why. 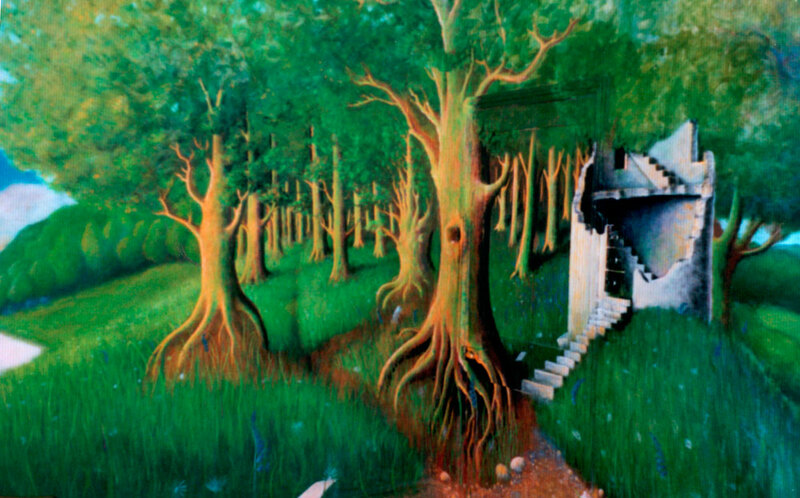 It was another doodle, painted in 2005 in just over a day, without any planning. At the time I had been thinking a lot about Rachel Corrie, a young US activist who had died while trying to stop an israeli “military bulldozer” from destroying the home of a Palestinian family, (who happened to be a Doctor). Her tragic death had got a lot of international press, probably because she was a pretty and young american woman. 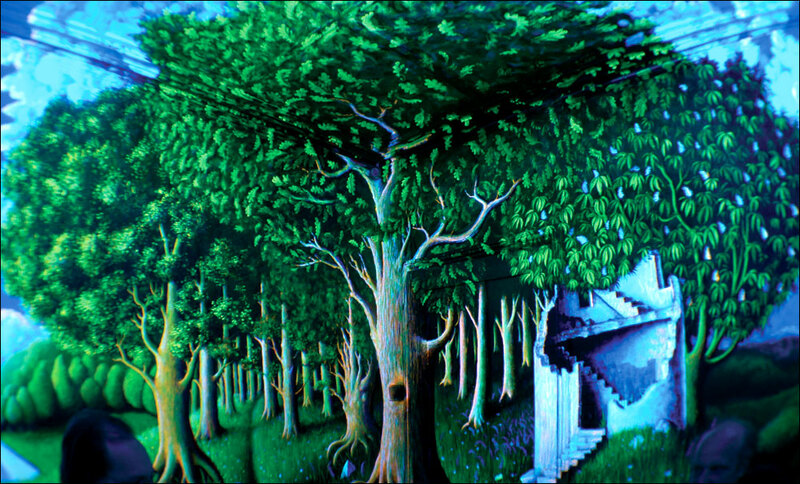 This story was in my head while I painted this mural. The two figures in the tree are trying to stop the bulldozer from ramming the tree. 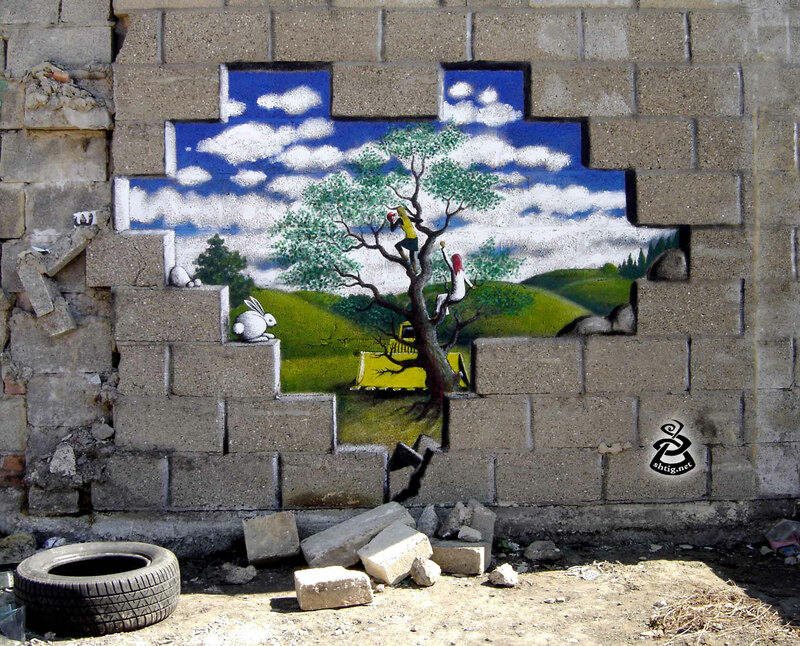 The white rabbit is inviting us to jump through the hole in the wall, and join in to help. Click on the image to see a larger version. While painting this doodle I was also inspired by the recent work of Banksy during his 2005 visit to Palestine, where he painted on “the wall”. An Oxford photographer called “Kamshot” took a photo of this mural which came second in a Guardian photography competition. 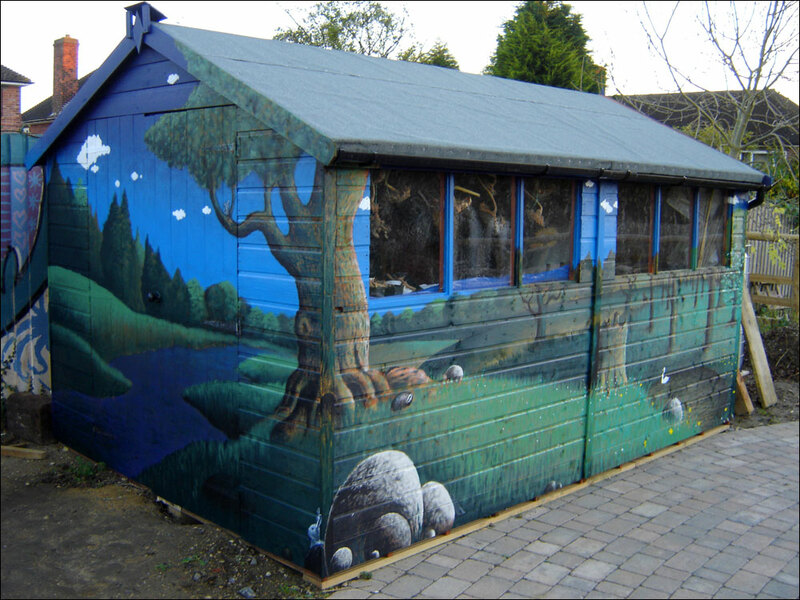 Painting on the side of the shed at Barracks Lane Community Garden, back in 2005.
in residence’ in a private home. In many ways this was a wonderful time. with light. Having such a paint made it easier to recreate a 3-D feel. But it was not easy. I had to learn a whole new way of mixing colours. 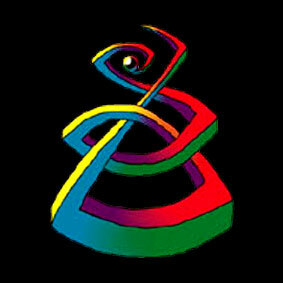 The number of different UV colours available is quite limited too. painted on the garden fencing that ran alongside the back patio. 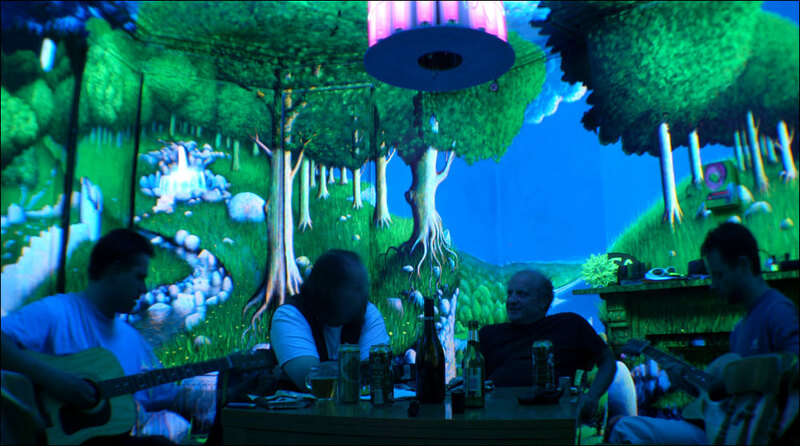 Here is the same scene, taken at night when the UV tubes were on. The distortion of the view is due to the photographer using a fish-eyed lens. 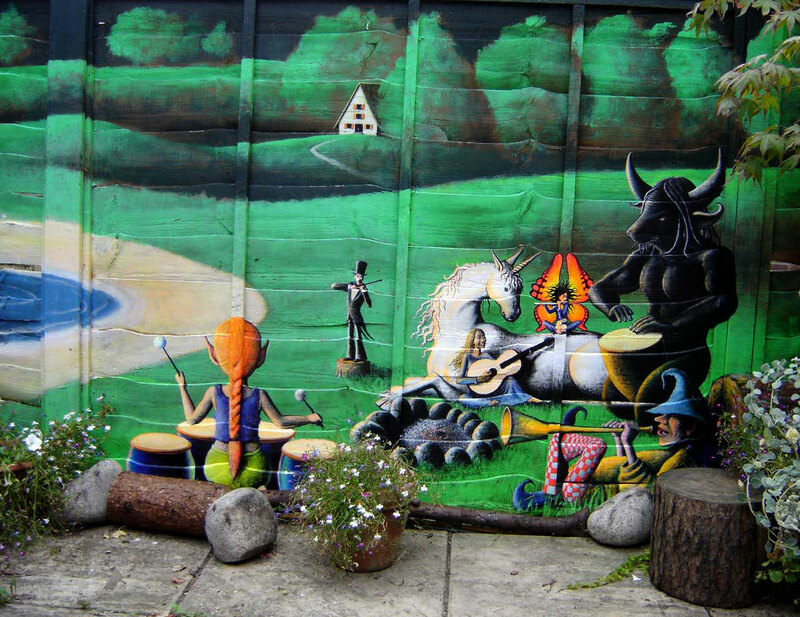 A little further along the fence is the “Band of Myths” mural, again seen in daylight. Each of these characters is from a favourite myth or legend, and many of these figures are also caricatures of some of the regular visitors to the house. The house had a LOT of great parties, the best of which involved many musicians jamming together. 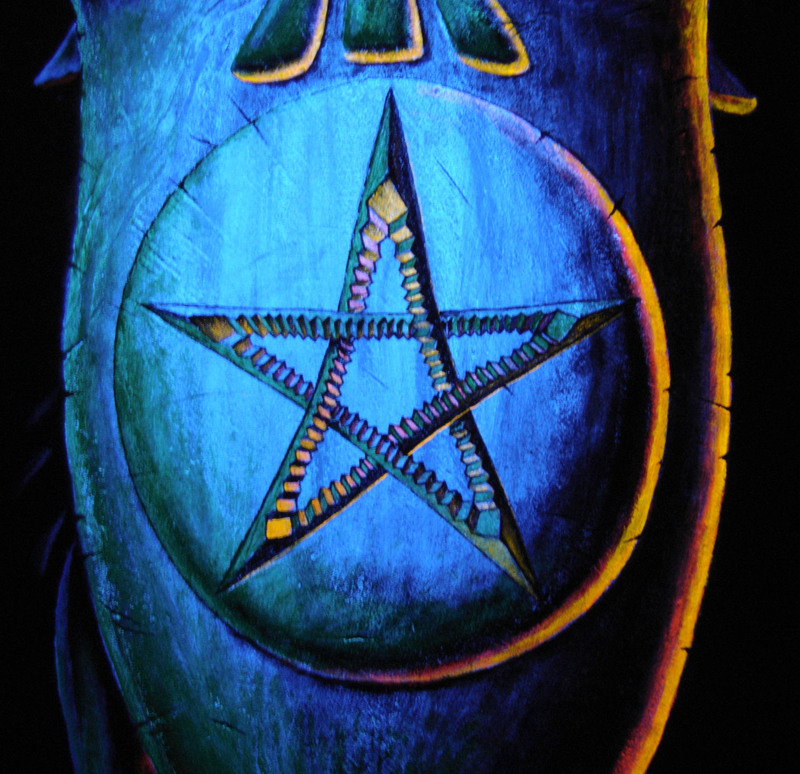 The regular parties became the hub of a community, one that still continues to evolve, focused around a camp-fire party in a nearby woodland every full-moon. The dark mountain has a large speaker mounted on the wall in front of it, barely visible. Below are two more views. Just after I finished painting the walls, ceiling, and most fixtures of the lounge, Don tells me that green is one of his least favorite colours! Ha. He then invites me to continue the nature-scene out the door, into the corridors and both up the stairs and down into the basement. My excellent rent-deal is secured for another few months! Below is where the painting started. 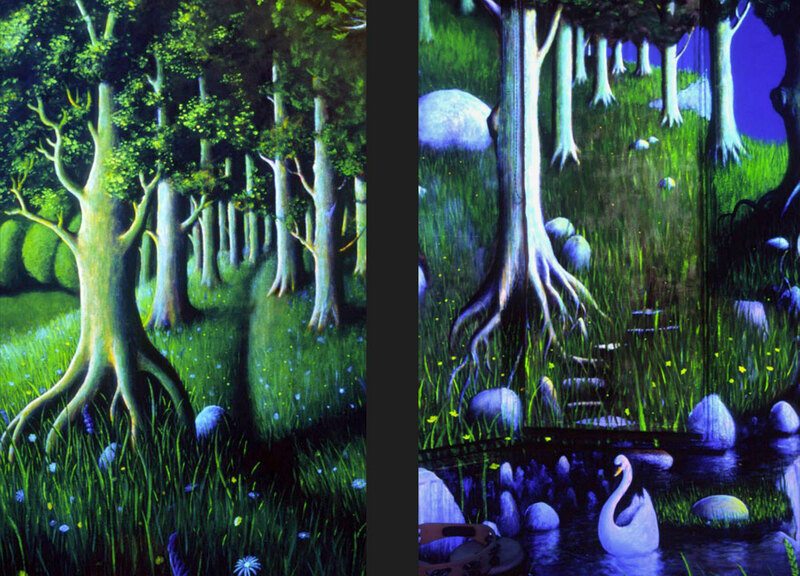 Below is the same scene in it’s first original form – painted in non-UV paints back in 2001. The best times, for me, were the annual 9-day-long “Artweeks” shows, where the house was open to the public for guided tours each May. About a hundred people per day came through. Most years we had 4-6 tour guides taking small groups of people around the house. Children were especially moved, sometimes resisting their parent’s efforts to leave. Comments in the visitors’ book were a good laugh – the most common word being “Amazing!” Sadly, no one made a film of one of these tours, as far as I know. The owner of the house was unable to become a dot-com millionaire, and eventually he had to sell the house. Estate agents were quite amazed by the house, but persuaded him to white wash all the walls. We were not surprised. The “Astonbury” era had come to an end. Don and his special house have become a bit of a legend. He had a small website made to document the house – it’s still on-line here. You can see more photos of the house, including fantastic sculptures, bizarre furnishings, the infamous red-room, the beautiful garden and much more. Sadly Don died quite unexpectedly in October 2012. He had many good friends who will miss him a lot, and as you may know his wake was a fantastic party, just as he would have wanted. This mural is on the side of a fish and chip shop on the Cowley Road in East Oxford. 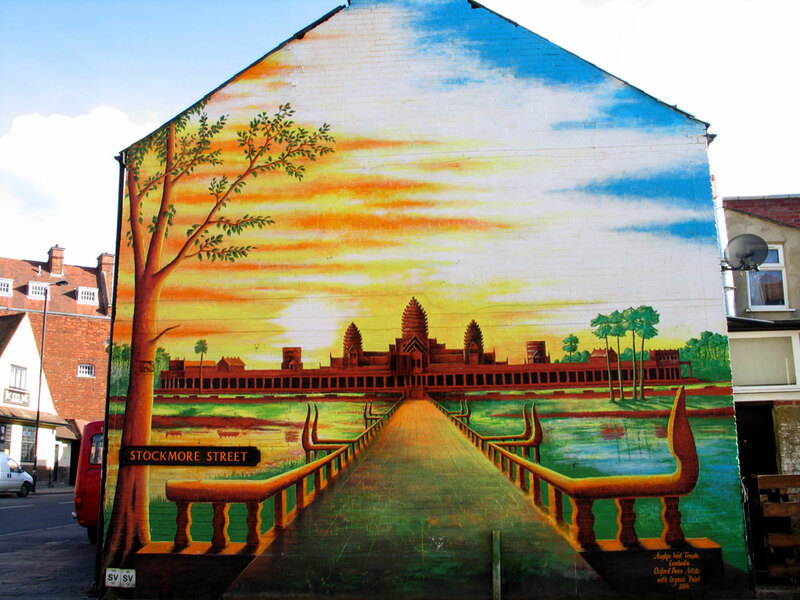 It’s 4 floors high and is based on a painting of the famous lost city of Angkor Wat in Cambodia. The chip shop is owned by a lovely couple from Cambodia. Sadly the wall was not in very good condition when we got to it, and we were so keen to get painting that we neglected to do much-needed re-pointing. So in some places the paint has fallen off a bit. But it does still look quite impressive. We used ECOS organic outdoor water-based gloss paints for this job, which we were very happy with – thick non-toxic and virtually odourless. We hired a small wheeled scaffold tower for a week to do the painting. 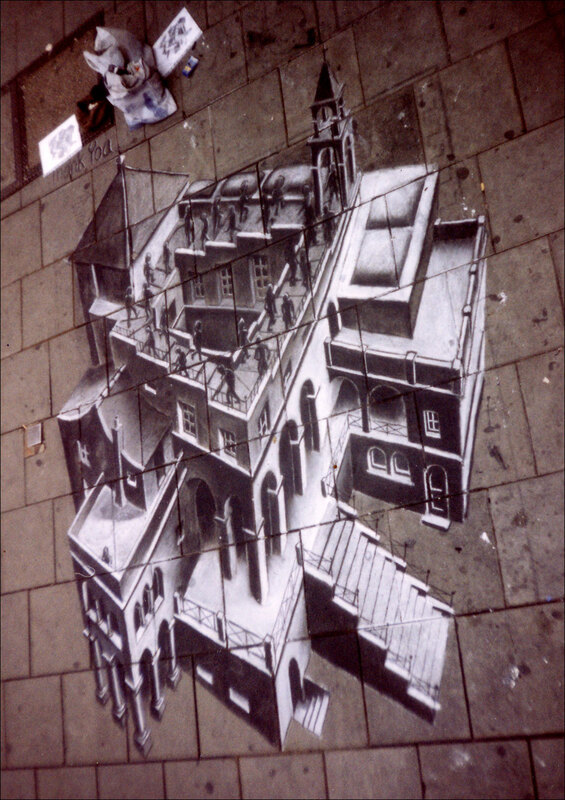 Old pavement drawing from the mid 1990s, copying one of the most famous drawings by the dutch artist MC Escher. He is one of my heroes, and this clever drawing makes a cunning use of twisted perspective to convince the eye that the monks are walking around the steps in a continuous never-ending cycle. My friend stella helped me. It was great fun! 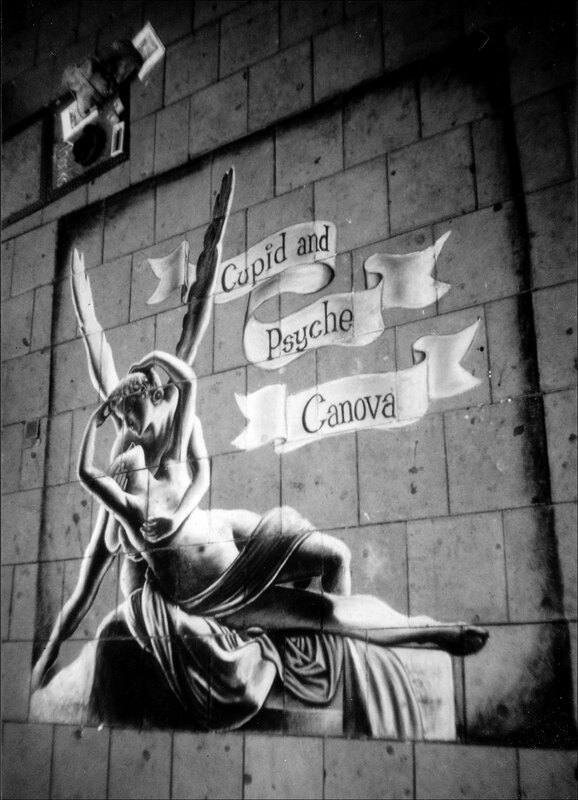 This is another pavement drawing, of a photo, of a statue by Canova, depicting the lovers Cupid and Psyche from Greek mythology. So is this Art reflecting Life reflecting Art reflecting Myth? Hmm. 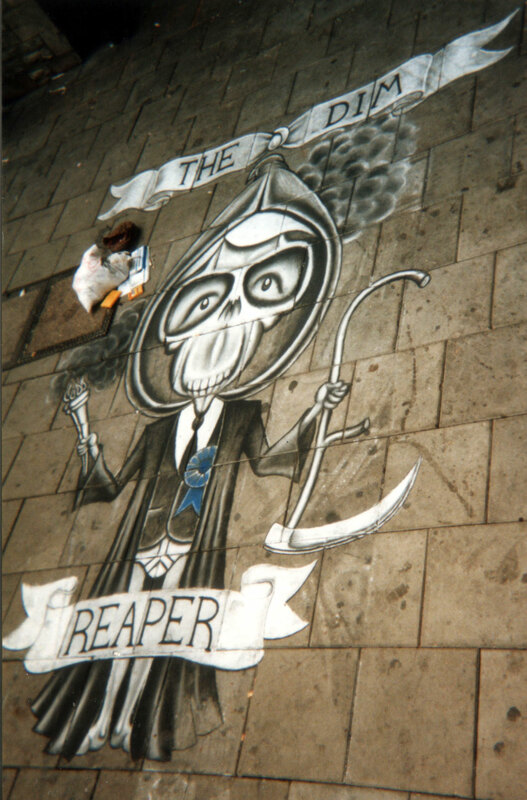 In the 1990s I drew a dozen or so pavement drawings, usually copies of old paintings. The first one I did was a portrait of John Lennon. Nowadays you need a licence from the council to do this. It was an early start and the ground is often cold. We used white chalk and compressed charcoal. After a few days the images faded, and after a bit of rain they were gone. Below is a rare political pavement drawing I did depicting the prime minister of the time, John Major. One old chap gave me a five-pound note!